Each year, February is designated as Pet Dental Health month. 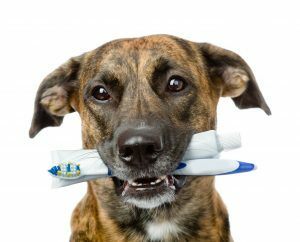 Various organizations, such as the American Veterinary Medical Association (AVMA), and the American Veterinary Dental Society, promote pet dental health awareness campaigns. February isn’t the only time to think about good oral health though. Keeping your pet’s teeth and gums in good shape has many health benefits in addition to the sparkling fresh breath. Now is the time to schedule that checkup for your pet to ensure the best dental health possible. Both plaque and tartar damage the teeth and gums. Disease starts with the gums (gingiva). They become inflamed – red, swollen, infected and sore. The gums finally separate from the tooth surface, creating pockets where more bacteria, plaque, and tartar build up. This leads to more damage, and ultimately tooth and bone loss. Dental disease effects the whole body, too. Bacteria from these inflamed oral areas can enter the bloodstream and affect major body organs. The liver, kidneys, heart, and lungs are most commonly affected. Antibiotics are used prior to and after a dental cleaning to prevent bacterial spread through the blood stream. But my pet is only 3 years old! Isn’t this an “old dog/cat disease”?